It is easy to lose sight of just how much a slightly different fee schedule can make to our bottom line. It’s also eye-opening to see how much those extra AMC fees can dent our income. 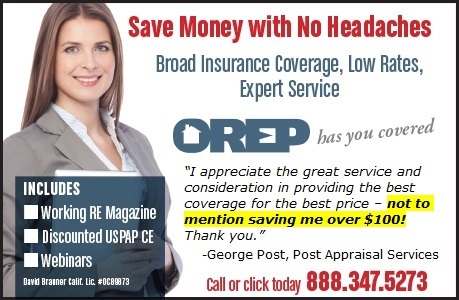 I think it’s important for appraisers to take a step back now and then to take a look at their fees and their market, because the fees we accept ultimately have a huge impact on our quality of our life and our income. This article is not about price fixing but rather the financial consequences of the current AMC environment, accepting lender work at a below market rate, and charging an under market rate for private work. There is a huge cost to discounting our services. When looking at the numbers, if we charge below market, we might end up working for weeks longer each year (some well over one month). For instance, imagine an appraiser does five appraisals per week and 250 for the year. 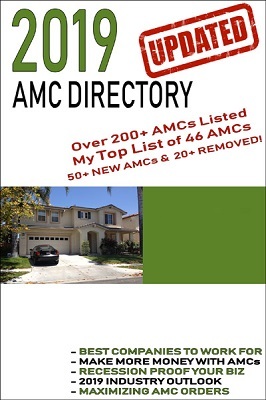 If an AMC is paying the appraiser $50 less than a market rate, that might not seem like a big deal. 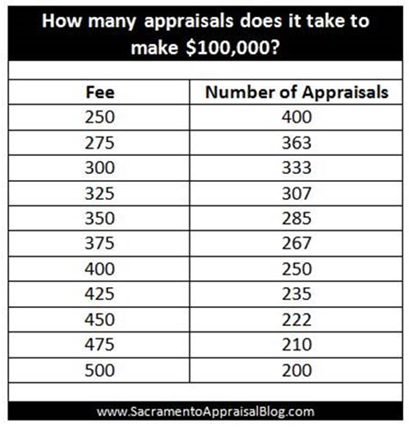 But over the year, $50 less on each appraisal adds up to a whopping $12,500 of lost income. Or consider that pesky $10 AMC “tech fee,” which seems so minimal but it adds up to $2,500 over the year. Or maybe you pay a $13.95 portal fee, which is a cost of doing business, yet it adds up to about $3,500 for the year. Yikes! The question becomes, how many more appraisals do you need to do to make up for the loss in income? How many extra weeks of work is that? This is why small fees matter. I know, some appraisers are saying, “yeah, but I’d rather get $50 less than nothing.” I get that, and I’m not telling you to stop working or feeding your family. I’m only highlighting the reality that lower fees (even slightly lower) make a huge difference in our livelihood, which is why this conversation is important. I would never tell another appraiser what he/she should charge or accept. After all, fees vary depending on the region of the country as well as the complexity of the job at hand – not to mention the skill level of the appraiser. The key is getting a sense of what the market rate is for the area and then competing at a level that is hopefully somewhere near that rate. Of course there is always a fear of losing clients when we raise our fees but some clients are just not worth keeping, right? As far as quoting for private work, remember borrowers are accustomed to paying good money for mortgage appraisals. Some appraisers forget this, so they end up quoting below-market fees that are more in line with what a bad AMC might pay. In short, don’t let lowball AMC fees cloud your judgement of what the market rate is for private work. Figure 1 shows the real cost of accepting lower fees from AMCs as well as undercharging for private work. 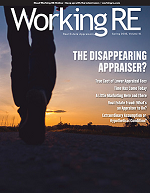 One of the best things appraisers can do to negotiate higher fees is increase their skillset. Creating a better product ultimately attracts better clients over time, which also helps us drop the bad ones. You may be thinking that the clients you are working with don’t care about quality or expertise. If that is your situation, then all the more reason to build your skillset and get busy looking for clients who do want a valuation expert, rather than a form-filler. Not only must you expand and improve your expertise, but you must position yourself as the go-to valuation professional in your local market. One of the biggest mistakes appraisers make is to distance themselves from the rest of the real estate community. There is often an “us vs. them” mentality that typifies the appraisal profession and makes it fairly typical for appraisers to have a negative attitude toward real estate agents and loan officers. I understand we play on a different team but if we view the real estate community with contempt or think agents are the enemy, my guess is we’ll struggle to position ourselves as trusted experts and/or get referrals. I know this is direct but if you are in the habit of complaining about real estate agents or even AMCs, especially on social media, maybe it’s time to find a new shtick. Remember, if you think someone is an idiot and talk about that person like an idiot, that person is probably not going to hire you (is that really professional anyway?). When it comes to raising my fees, I began seeing breakthroughs when I set small goals. My initial goal was not anything drastic, like doubling my fees, but simply to raise my fees slowly over time as my skills increased. For instance, a few years ago I made it my goal to raise my fees by $25. The next year I made it my goal to raise fees by another $25. I also chose to recoup a $13.95 portal fee a few lender clients were charging by increasing my fee in the AMC’s system by that amount. A direct lender client was also charging me a technology fee at $9 per appraisal, so I began charging them an extra $9 in each report on top of the appraisal fee. Several years ago, I also began slowly saying goodbye to lender clients too by aiming to increase my private work. This goal was not drastic either but gradual and over time. My goal this year for private work is to increase my fees by a minimal amount. I also have a goal to charge by the hour three times this year for litigation work. I really enjoy the role of a consultant too, so I am constantly finding ways to offer paid advice to clients, create graphs for hire, and find situations to provide a range of value instead of being stuck on only one number (not to mention stuck reporting in a form). Lastly, I am finding more opportunities to get paid to speak, which is an enormous passion. Years ago I used to advertise on Craigslist because it’s free. But I found most people who contacted me wanted fast and cheap appraisals. Don’t get me wrong, I love Craigslist, but I stopped fishing there for work because it wasn’t leading to the type of client I wanted. This was an important turning point for me because, let’s face it, there are always clients who want to pay less. I began asking myself who I really hoped to work for, and then I took intentional steps toward getting those types of clients. So far this year, 89% of my orders have been non-lender, and that is not an accident. It is the result of years of intentional effort to build relationships with people, be a resource to agents, and earn business. 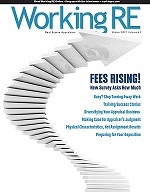 Many appraisers feel stuck by the AMC system, and my heart goes out to my peers who are struggling. But thankfully we are not victims and at the end of the day we can choose our clients. Just like I chose to stop advertising on Craigslist because it didn’t meet my goals, there are some appraisers who need to figure out who they want to work for, go after those clients, and taper off of the bad ones over time. The following four factors have made an enormous difference in my business: 1) learning to graph has enabled me to see the market visually, which has helped me excel at explaining it to others; 2) six or so years ago I joined the local association of Realtors in my area and I have served on many committees there; 3) starting an appraisal blog seven years ago was an absolute game-changer for me since it gave me a platform to be a resource to my community; and 4) I joined a local appraiser association several years ago, and meet with other appraisers every single month. We help each other get better. I know very few people who have amazing clients and got them by accident. I also know very few people who became more professional by accident. Business is about relationships, so it’s important to start getting in front of other people to cultivate relationships that can be lasting. It simply takes effort to make this happen. You might consider joining your local Realtor association (and serve on a committee), speaking in real estate offices or finding some good local loan officers and getting on their AMC panels. It might be helpful to pay attention to some appraisers you think are getting it right, start a blog where you post helpful content for your target audience, hone your graphing skills, stop quoting fees to bottom feeders (replace them as soon as you can), and be creative and strategic about winning the hearts and minds of people you want to work for. Just as a fisherman asks where the fish are, we need to ask where the good clients are and stop wasting our time with bad ones who blast orders, seek the lowest bidder, or have ridiculous expectations. One of the most common marketing “techniques” is to wait for the phone to ring. We’ve all been there but how effective is that? Who are your ideal clients? Who do you want to work for? I say go find them… and then charge a reasonable market fee. Do you have the proper support for your adjustments? 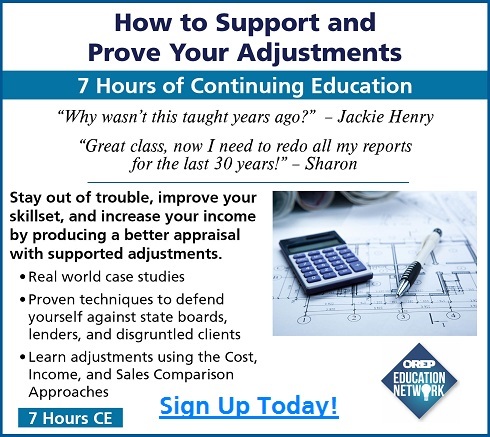 Stop taking the same old CE courses and learn proven adjustment methods with instructor Richard Hagar, SRA. Fannie Mae states that the number one reason appraisals are flagged is the “use of adjustments that do not reflect market reaction.” Stay out of trouble with Fannie Mae, your state board and your AMC/lender clients with solid, supportable adjustments. Up your game, avoid time-consuming callbacks and earn approved CE today! Ryan Lundquist is a certified appraiser and focuses on residential appraisals in the Sacramento area. His clients include home owners, real estate agents, governmental agencies, attorneys, and lenders. Lundquist runs the SacramentoAppraisalBlog.com, a top-ranking appraisal blog in the United States. He won the Affiliate of the Year award in 2014 from the Sacramento Association of Realtors. He is also the Chair of the Housing Opportunity Committee with the Sacramento Association of Realtors and a board member of the Real Estate Appraisers Association of Sacramento. I think it is very important to remember that agents are in the market even more than we are, and that they deal with buyer hopes and dreams, and seller wishes all day, every day. This is certainly not something to discount, and in the end, agents can be an excellent referral source as well. While the forthright, call it as you see it appraiser, may not end up being the go-to for mortgage work (probably won’t) there certainly is an abundance of other work out there. Thanks Rachel. I agree with you about agents. If we claim to come up with market value, it’s probably a good idea to pick up insight from the real estate community. How did actual buyers respond to a property? Agents can fill in the details beyond mere facts like sales price and bed/bath count. Keep up the great work in all you are doing, Rachel. Great article Ryan. I like how you note that your client base is the way it is because you have been intentional about cultivating non lender clients. I believe doing business like this will help us as appraisers be able to chart our own destiny and not have to rely on flakey lenders and the volatility of the market because of interest rates. Thanks Tom. Well said. I like how you said “chart our own destiny” too. Our industry often feels like we are not in control, but we are. I know you’ve done a great job seizing control of your business too with all the blogging you’ve done. Kudos to you my friend. I agree with raising fees. I was initially reluctant to raise my fees because I was afraid I would lose clients, but I found that I did not lose them and they tell me that fees are not their primary concern when assigning orders. I have raised my fees 3 times in the past 3 years, am making more money and have the ability to work less if I want to. It feels good to be paid what I’m worth without fear of losing business. Congrats. Way to go!! I’m elated to hear you have more time. I feel the same way too. Nice article by Mr Lindquist: I heartily agree with his point of view on developing clients. I can say unequivocally that it is a strong and proven strategy: it works beautifully. The article has a positive tone, which I find much more engaging than the ones that seem to parrot “appraiser complaints” and shill for amcs. Those of us who haven’t come to this knowledge level yet or haven’t had the kind of education that provides this type of business strategy will benefit from this article, so thank you for putting out this essential advice for free. Also, the fact that it needs to be said reinforces my belief that education is key to success. Yes, I do believe appraisers need the kind of disciplined thinking and practical knowledge that comes with a bachelors degree. So thanks for a well written article with a positive, useful message. Very well said Bridget. You have a way with words, by the way. Negativity is an easy route to take, but a positive forward-thinking vibe goes a long way in this profession.